Welcome to spacious condo living at Foxhaven Condos. This project is a hidden gem built in the early 2000s. 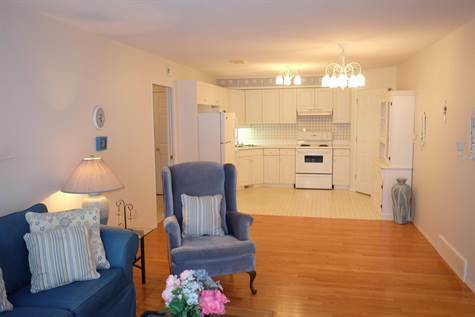 Hard to find 3 bedroom coach style ground floor condo in immaculate shape. Original owner unit with no pets and non-smoker. Pride in ownership abounds. If you have been thinking of making the transition to condo living, but are concerned about space, storage and location, give this home a look. Open concept living room, dining area and kitchen. Lots of storage with a walk in pantry, laundry rooms, mechanical room and a storage room plus and exterior access storage room. This is a very bright and clean corner unit facing the north walkway with a courtyard feel and west facing windows for the 3 bedrooms. The condo is move in ready and quick possession is available. This is one of the larger units in this development and has upgraded hardwood flooring in the living room, dining room and hallway. Foxhaven also boasts a rec/fitness center amenity room great for entertaining and celebrating, with attached outdoor patio and courtyard, and lots of bike parking. Located at the west end of Sutherland, this location is close to the University of Saskatchewan, many services, public transportation and is a quick drive to Circle Drive and Attridge Drive. This is a mixed age condo and pets are allowed subject to board approval. Excellent home if you no longer want the work of caring for a house or if you are looking for a 3 bedroom condo for students and professionals. Buyers responsible to verify measurements.